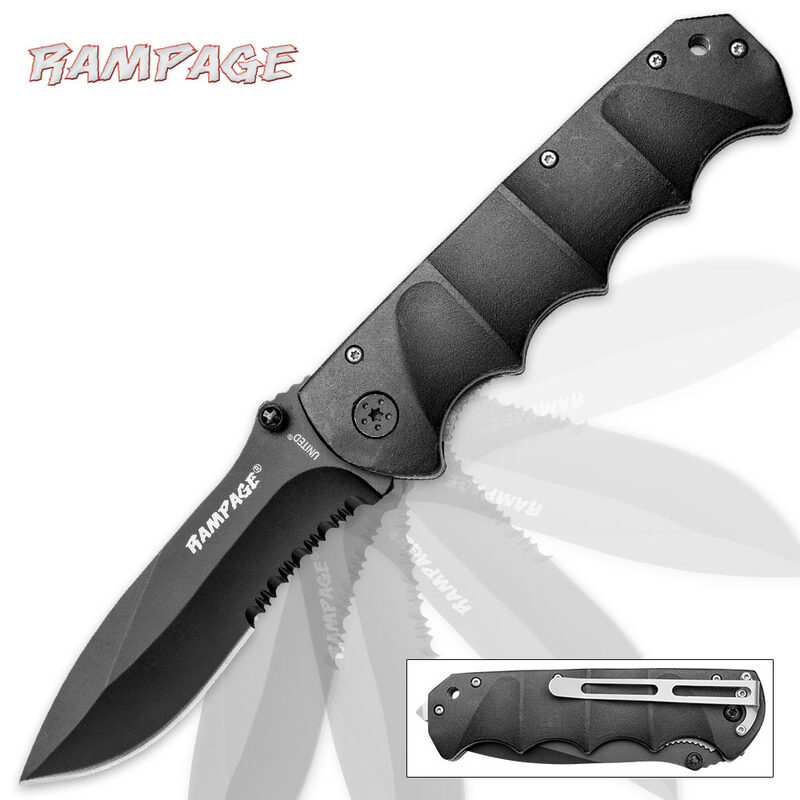 This Rampage Stealth pocket knife is perfect for any mission. The modified 3 7/8" 440 stainless steel spear point blade has a slight recurve shape, and is black coated and partially serrated, ideal for chewing through fibrous materials. 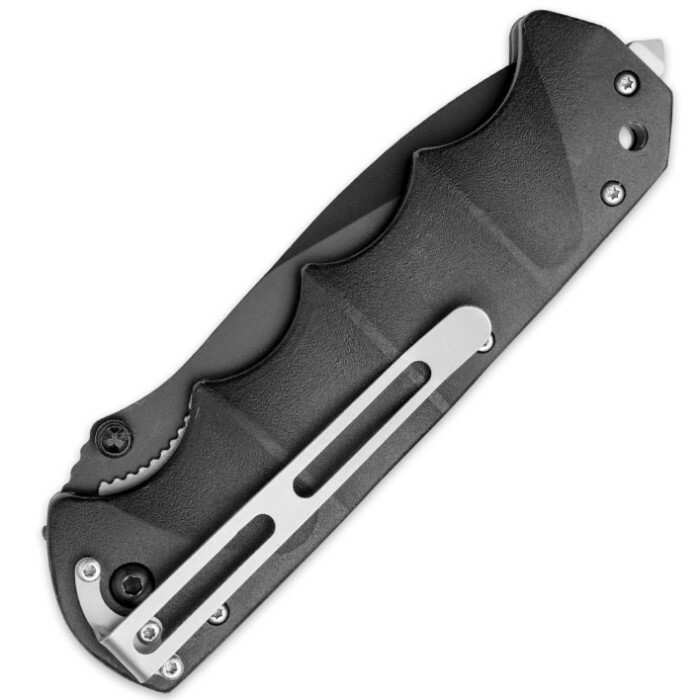 The black aluminum handle is shaped with comfortable finger grooves and a tough pocket clip keeps this beast of a blade close by your side at all times. Whether your slicing through boxes in at your day job or constructing a survival shelter in the Peruvian jungles, this knife will never let you down. I love this knife the second I held it in my hand. It's got very good weight and action for the price. It might be too big or heavy for smaller users but overall managable. this is a well built knife for edc. this is my second boker knife and i will definitely buy more in the future because of the quality. Great knife to have and use. Very useful in every aspect. Has but two flaws. The pocket clip is not as sturdy as I would like. Also the handle is slick/smooth. It does not have the grip that I was expecting. However it fits nicely in my hand and came from the factory razor sharp. I also love the fact that it has a 440 stainless steel blade unlike those cheap aus blades. I expect that the knife will stand up to any abuse that I can put it through, and I demand a lot from my knives. Nice knife, heavy and solid with no blade play like I like them. Sharp, fits in hand well in forward and reverse grip. My only issue is the pocket clip is flimsy. It does not match the quality of the rest of the knife. I had it in my front pocket, and the lip caught on something and bent badly. When I took the screws out to bend it back, I noticed the screws were stripped when installed, and rendered useless after removal. I just got a case for it and ditched the clip, the knife is worth keeping, clip or no clip. best deal on a pocket knife! I have seen this knife before from people that ive met and always figured it was in the $70+ range but when i saw them here for under $20, i had to give them a shot. They are a lot bigger in person than in the pic. Little on the heavy side but not a bother. Good weight, feels great in the hand, and very solid! Not loose at all. I think the thumb stud issue is due to placement in the pocket because of the clip. The stud will tend to get caught during retrieval out of the pocket. Grinding it down, or having the manufacturer give it a lower profile, would rectify the problem. Such a fantastic deal for the price, i bought three of them as i sometimes lose my pocket knives. Highly recommended! When I ordered the knife I was not expecting anything much for $16.00 I was really surprised. The blade is heavy and feels like it could cut open a car. Whether you use a forward grip or a reverse grip this knife develops momentum for deep penetration, and it holds an edge well. This is a solid heavy knife. 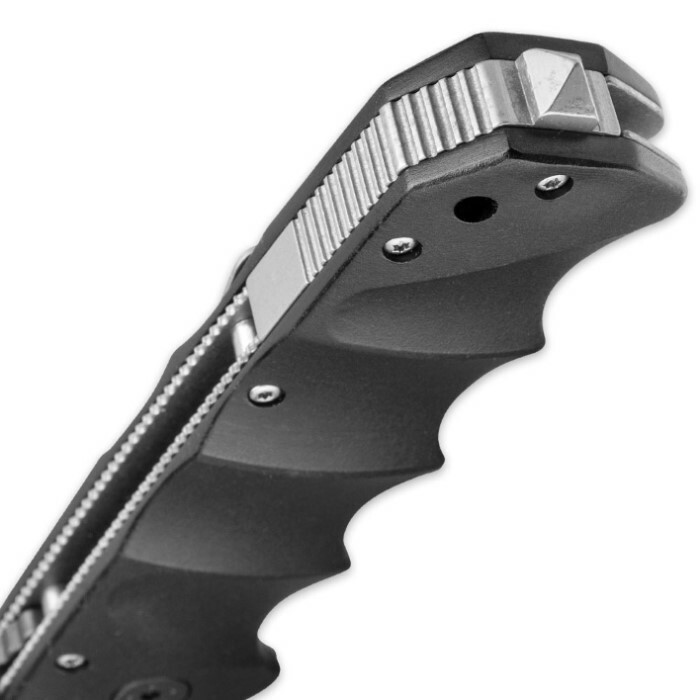 Finger grooves place your hand as needed for maximum thrust while blade size and design is intimidating to a would be attacker in an urban assault situation. Fit is tight, not loose. Everything locks up well and stays that way. All in all its a great defense piece for under 20 bucks. If I could change one thing, I would have preferred it in a non-serated version. This knife is so underpriced. I've had mine for a month so far and it's great. Comes super sharp out of the case and is pretty heavy. The knife doesn't have any loose parts and is super rugged. It says the knife was made in Germany and it sure seems like it. Great knife. Definitely a good buy. I had considerd ordering this knife on multiple occasions. Rescently I lost my Schrade extreme survival knife, and needed a replacement. The reviews here seemed overly hyped for a knife of this price, But I assure you THIS KNIFE IS AN INSANE DEAL for the price. It looks alot better in person than it does in the pic. Huge, solid, smooth, sharp. Best knife I've had in awhile, best ever for the price, BUY IT! DO IT! GOG GO GO!